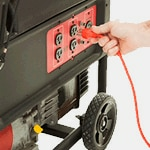 Does your generator outlet trip every time you connect it to your home's transfer switch? Are you frustrated with searching for a solution through numerous bonded neutral articles and generator forums? The solution is simple: if you have a bonded-neutral generator with full GFCI protected outlets, you'll need to get a GFI transfer switch to keep those circuits from tripping. 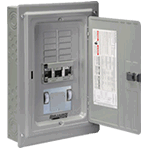 Knowing which transfer switch will perfectly match your generator isn't difficult. The chart below will help you determine whether you need a standard transfer switch or a GFI 3-pole transfer switch, based on your generator type. First, What Does 'Ground' Mean? Electricity, following the path of least resistance, will always try to find a way to ground itself or a way to release its electrons. Since the earth makes a great path for electrons, that's where current will flow like in the case of a short-circuit or a lightning strike. The danger comes into play when you are caught in-between that path. So the electricity flows through you instead of directly into the ground. 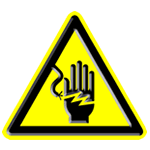 A grounding wire (usually bare copper or green) is used to prevent shocks by routing rogue electrical currents away from a person, should a fault occur. A ground wire is attached to a metal grounding rod buried in the earth. Neutral wires aka "grounded neutral" are a source of confusion because they too are grounded; the difference being that they serve as part of the circuit by routing current back to the source. With a bonded neutral generator, the neutral is connected to the frame of the generator. Safety code requires the neutrals to be averted away from the original source (your panel) and connect to the "first means of disconnect" when using the generator. This ensures that electricity will flow properly through the neutral conductors and is delivered to one bonded location — eliminating unpredictable stray voltages caused by connecting to the ground twice. A floating neutral generator's neutral circuit is not connected to the generator's frame or the ground, meaning it is required to connect the neutral to your existing panel neutral. Both hot and neutral conductors in the receptacles are considered "hot" on these generators, and can both be used to eliminate the risk of shock by allowing electrical currents to connect to the generator frame simultaneously during a short circuit. GFCI stands for ground-fault circuit interrupter. This switch is needed to eliminate the ground loop and prevent the outlet from tripping. Most built-in GFCI's found on portable generators protect the household type 15/20A, 120-volt outlets, and not on the 120/240 outlets that are used to connect to home transfer switches. The only time you'll need a GFI transfer switch to connect the generator to your home, is if your generator is fully GFCI protected. Meaning, its 120/240-volt outlets are GFCI protected and without a GFI switch, it will create a ground loop and trip the circuit. Is My Generator GFCI with a Bonded Neutral? The best way to know if your generator has full GFCI protection on all its outlets including the twist-lock 120/240V is to look at the front panel, owners manual, or go to the generator product page on our site and look under the specifications tab. If you no longer have the owners manual, you can find it through our owner's manual look-up tool. Do Not Modify Your Generator! Never manually disconnect a bonded neutral generator. It's not only dangerous but will void the manufacturer's warranty and against many regulations. Using a GFI transfer switch will allow you to connect to your home's main panel without tripping, and you'll still be GFCI protected when using your generator out in the field or on the job site. HOW TO AVOID TRIPPING A BONDED NEUTRAL GENERATOR. The experts at Electric Generators Direct explain how to keep your generator from tripping a breaker when plugged into a transfer switch. We explain the safest solution. Don't disconnect a bonded neutral generator because it's dangerous and isn't recommended by the manufacturer or OSHA regulators.